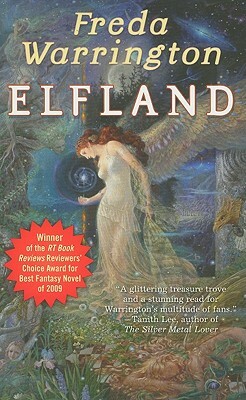 Elfland is an intimate, sensual novel of people--both human and Aetherial--caught between duty and desire. It's a story of families, and of Rose Fox, a woman born to magic but tormented by her place in her adopted world. Led by Auberon Fox, a group of Aetherials--call them the Fair Folk, if you will--live among us, indistinguishable from humans. Every seven years, on the Night of the Summer Stars, Lawrence Wilder, the Gatekeeper, throws open all gates to the Other World. But this time, something has gone wrong. Wilder has sealed the gates, warning of a great danger lurking in the realm beyond them. The Aetherial community is outraged. What will become of them, deprived of the home realm from which their essential life force flows? Rose Fox and Sam Wilder are drawn to the lands beyond the gates, even as their families feud over Lawrence's refusal to do his duty. Struggling with their own too-human urges, they discover hidden truths that draw them together in a forbidden alliance. Only by breaching the dreaded gates and daring the danger beyond can they confront that which they fear most-- their otherness--and claim their birthright.